S-200VE / SA-5 Gammon and S-75 / SA-2 Guideline SAMs (via Vestnik PVO). The Soviet Surface to Air Missile (SAM) force operated by the Voyska Protivo-Vozdushnoy Oborony (Voyska PVO or V-PVO) was the backbone of the Soviet / Warsaw Pact air defence system constructed during the Cold War era. The sophistication, depth and breadth of this overlapping and heavily integrated system of surface based air defences had a decisive impact on the evolution of Western air power, and provided the direct impetus for the development of key technologies in air defence penetration, including modern electronic warfare technologies (EW/EWSP/ECM), Terrain Following Radar (TFR), and Very Low Observable (VLO) or stealth technology. The earliest origins of the V-PVO SAM forces lie in the post World War II Soviet effort to strip occupied Germany and Eastern Europe of as much German technology, design documentation and design personnel as feasible – this was the Soviet mirror activity to the Allied Paperclip effort. Amongst the technology so acquired was the German EMW Wasserfall W1, W-5 and W-10 FLA Rakete, which almost achieved operational status, with some German sources claiming that some early trial rounds were successfully launched at allied bombers. The Soviets also acquired samples of the less capable Henschel Hs-117 Schmetterling FLA Rakete design. The Wasserfall was a direct offshoot of Werner Von Braun’s A-4/V-2 ballistic missile, but was fitted with additional cruciform wings and used an entirely different propellant system as the missiles had to be capable of sitting on a launch pad possibly for days awaiting a target. The Wasserfall's engine, which later had a profound influence on Russian SAM and ballistic missile propellant design, used a 250 atmosphere nitrogen pressurized self igniting or hypergolic propellant mix, with a Tonka or vinyl isobutyl ether fuel and SV-Stoff (Salbei) oxidiser, the latter comprising 90 per cent nitric acid and 10 per cent sulphuric acid. The missile employed manual radio command uplink guidance, using a radar beacon on the aft of the missile, another design feature which became prominent in Soviet SAMs. 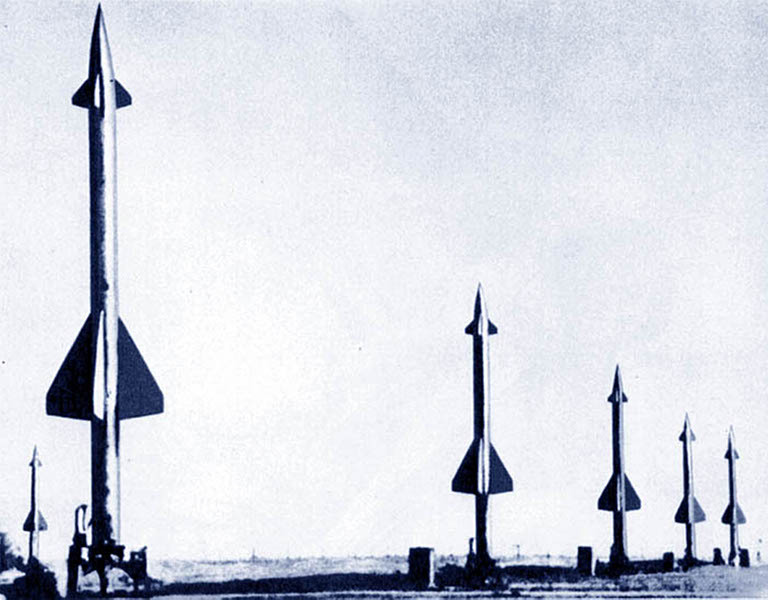 In May, 1946, a classified Soviet report labeled 1017-419 “Questions on Rocket/Jet Weapons” proposed that the Soviet military industrial complex further develop acquired German ballistic missile and SAM technology. As a result, the NII-88 design and development bureau was tasked with resurrecting the Wasserfall as the R-101 and the Schmetterling as the R-103. Russian sources tend to agree that this effort was not successful, with frequent launch failures during trials. The cited lessons learned were that proper guidance systems were required for such weapons, and that multidisciplinary design teams were required, mirroring earlier Soviet difficulties with nuclear weapons development. S-25 Berkut / SA-1 Guild battery at Kapustin Yar (Russian MoD via Miroslav Gyűrösi). The Soviets recognized the potential of the SAM as an air defence weapon, as their fighter aircraft were challenged in performance when trying to intercept the fast and high flying US B-29, B-50 and B-36 bombers. With the B-47 and B-52 in development, the Soviets needed a technological strategy for dealing with these threats. 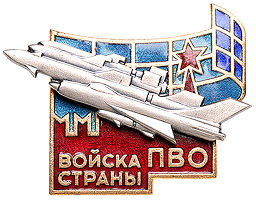 The result was the 1950 launch of a new program, the “System 25” or P-25 Berkut (Golden Eagle), later designated by the NATO codename of SA-1 Guild. 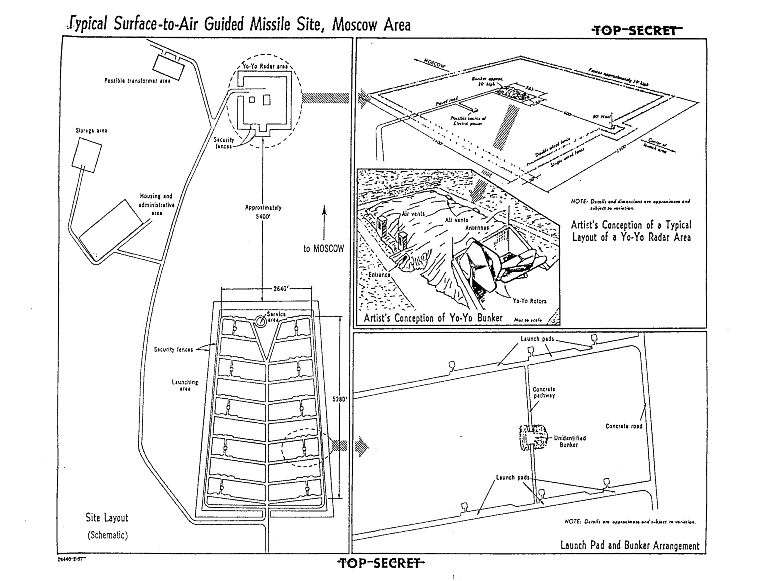 Provision of a layered SAM belt around Moscow was considered a top priority, to defend the centre of Soviet government apparatus and nucleus of its military industrial complex from nuclear attack by US and British strategic bombers. The success of the cumbersome SA-1 Guild led to the SA-75/S-75 or SA-2 Guideline system, which became the most widely exported and numerous SAM system produced by the Soviets. The SA-2 played a key role in the Vietnam conflict, but also formed the backbone of the first generation Soviet supplied SAM belts deployed by Egypt and Syria. The SA-2 also formed the backbone of Warsaw Pact SAM belts in Germany, Czechoslovakia, Poland and Hungary, as well as being exported to almost every Soviet client during the Cold War. 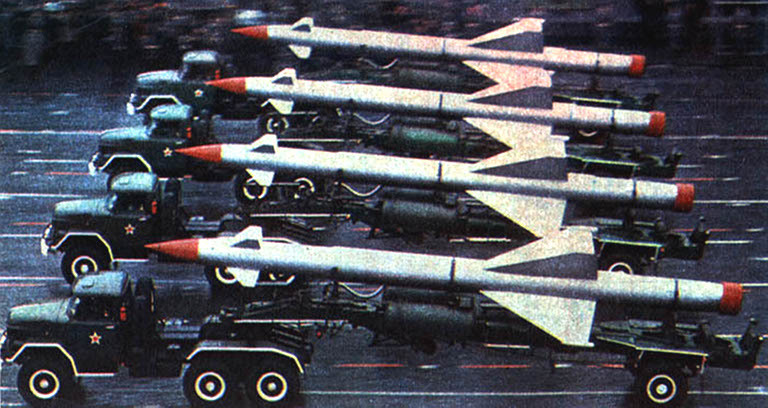 China reverse engineered the SA-2 during the 1960s, as the HQ-1, and later developed an indigenous derivative, the HQ-2, which has also been widely exported. 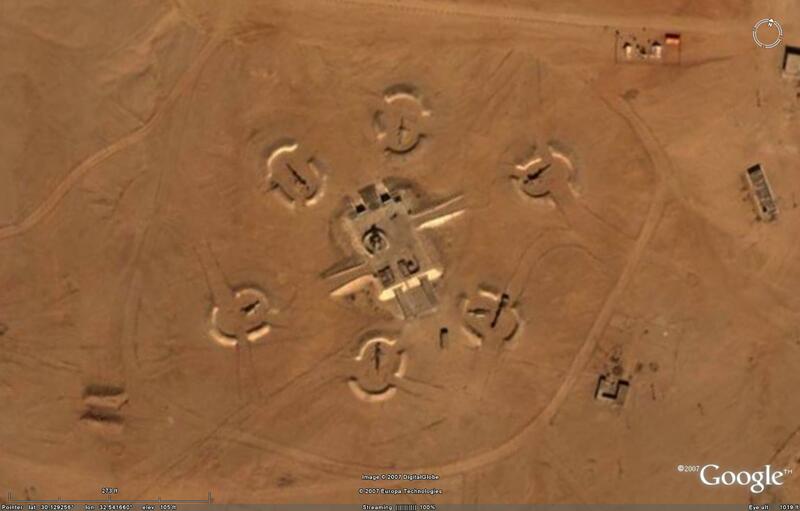 Much of Iran’s post Shah SAM system comprises Chinese supplied HQ-2s, replacing the US supplied Hawk SAM systems. The S-75/SA-2 was a new design but clearly showed its heritage. Two key design requirements for the S-75 were better range performance compared to the S-25, and much better deployability, as concreted pads were time consuming and expensive to construct. The S-25/SA-1 Guild and SA/S-75/SA-2 Guideline set the pattern for later Soviet SAM site design and configuration, a model which has remained in use even with the advent of highly mobile later generation systems such as the S-300P and S-400 series. 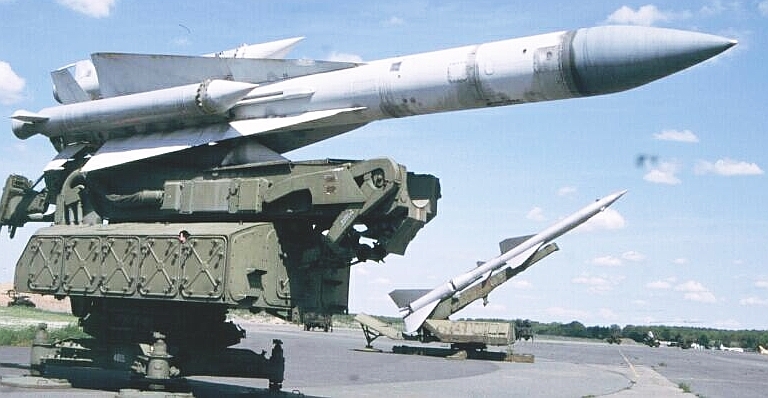 S-25 Berkut / SA-1 Guild battery components: V-300 missile round on transporter / gantry loader and B-200 Yo-Yo antenna. The SA-1 was a static system, which shared many design features with the German Wasserfall from which it evolved (via Vestnik PVO). The first operational strategic SAM system in the world was the Russian S-25 Berkut (SA-1 GUILD). The S-25 was a rail-launched system emplaced at fixed launch sites. The command-guided V-300 missile had a maximum range of 45 kilometers, and a maximum reach of between 4,000 and 14,000 meters in altitude. A 250 kg HE warhead was fitted. The S-band VNIIRT R-113 Kama (GAGE) radar provided target acquisition to a range of 300 kilometers. The Kama radars were to be used to cue the Article B-200 engagement radars. The S-band B-200 (YO YO) radar performed target engagement functions, with a maximum range of 150 kilometers and the ability to track between 24 and 30 targets per radar. Each B-200 radar could prosecute one engagement at a time. The B-200 Yo-Yo engagement radar with its characteristic and unusual triangular antenna system was designed to transmit two narrow beams, one to track the target and one the command link guided missile round. One antenna was used for azimuthal tracking, another for elevation tracking. The first prototype trials were performed on test ranges in 1952, with 81 test launches conducted by 1953, the Tu-4 being used as the drone target. The first operational S-25 systems were deployed in 1954, with IOC claimed in the 1955-56 timeframe. Russian sources claim that a key design objective for the system was to be able to track and engage twenty aircraft concurrently. All SAM battery components were sited in fixed hardened concrete installations intended to survive hits from US standard 2,000 lb high explosive bombs, with extensive earthworks and camouflage applied to make targeting difficult. The S-25 missile design was unique, but showed its Wasserfall heritage. The single stage liquid propellant rocket was deployed by a semi-trailer transloader, which doubled up as a elevating gantry to position the missile round on a fixed launch pad, in the manner of the A-4/V-2 and Wasserfall. The missile employed a unique control arrangement, with nose mounted canards for pitch/yaw control, ailerons for roll control, and tailfins for post launch alignment of the missile trajectory as it accelerated to speed. The 9 tonne thrust class powerplant was a direct derivative of the R-101 “Wasserfall-ski” engine, using an improved propellant mix. 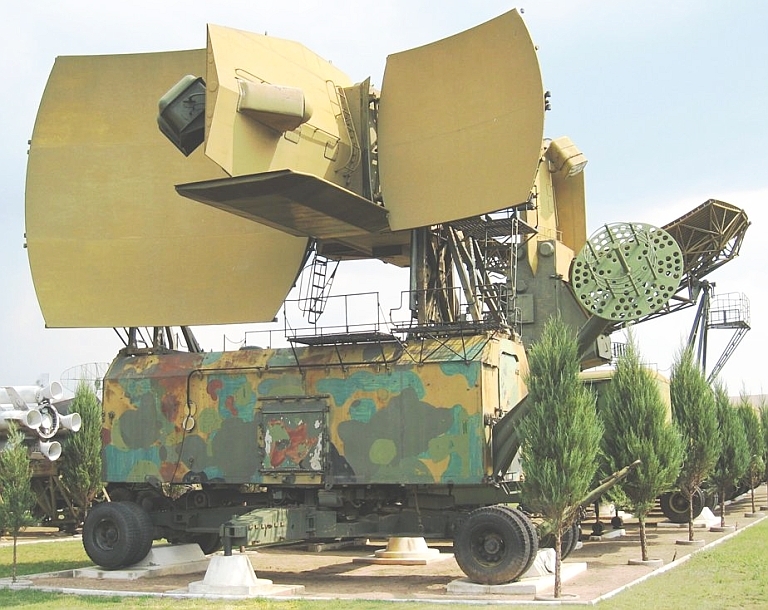 S-25 Berkut systems and associated Yo-Yo radars were deployed primarily to defend Moscow and Leningrad in concentric fixed SAM belts as initially planned. Soviet plans for the S-25 included a mobile launcher scheme on railroad cars, and a tracked mobile system, both of which were cancelled in favour of a new SAM system design. 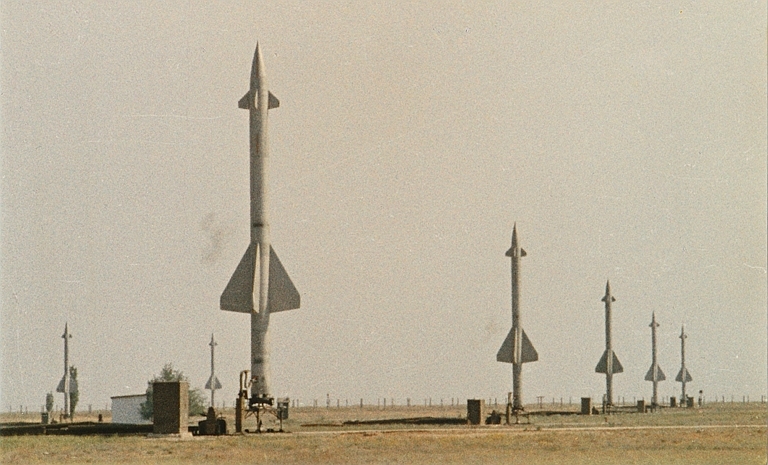 The configuration of SAM sites designed for the S-25 reflected the need to launch these missiles from pads, and fuel them using gantries, a model inherited from its German ancestors. On site storage was required for missile rounds and reloads, as well as for the cumbersome high energy liquid propellant mix. A deployed S-25 battery with multiple V-300 missiles located on their fixed launch pads (below). The transporter trailer was used to elevate the missile on to the pad, and doubled up as a gantry for fuelling the missile (via Vestnik PVO). By contemporary standards, the S-25 was a large missile (via Vestnik PVO). The S-25 system was intended to provide defense against an incoming bomber force of 1,000 aircraft. 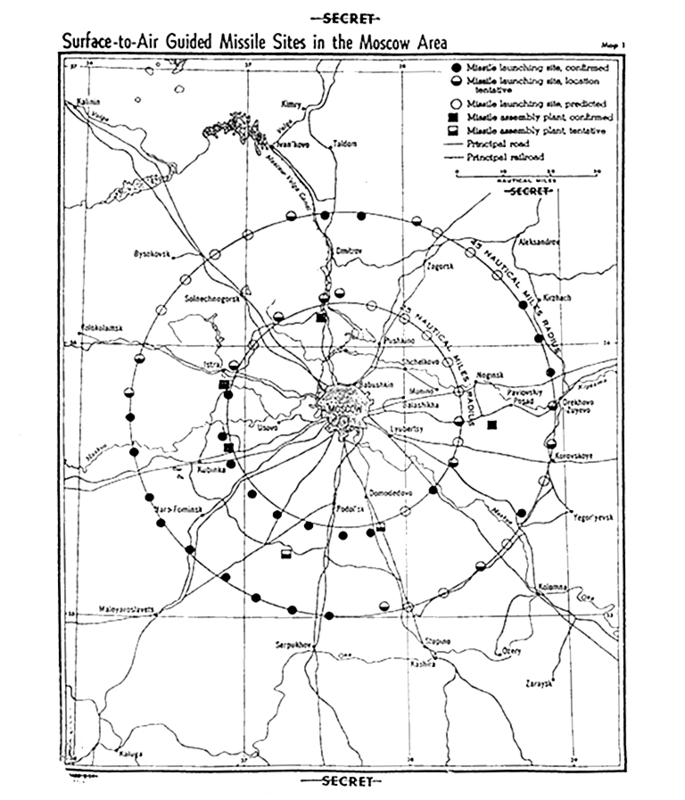 S-25 sites were located in two rings around Moscow, with radii 45 and 80 kilometers from the center of the city. 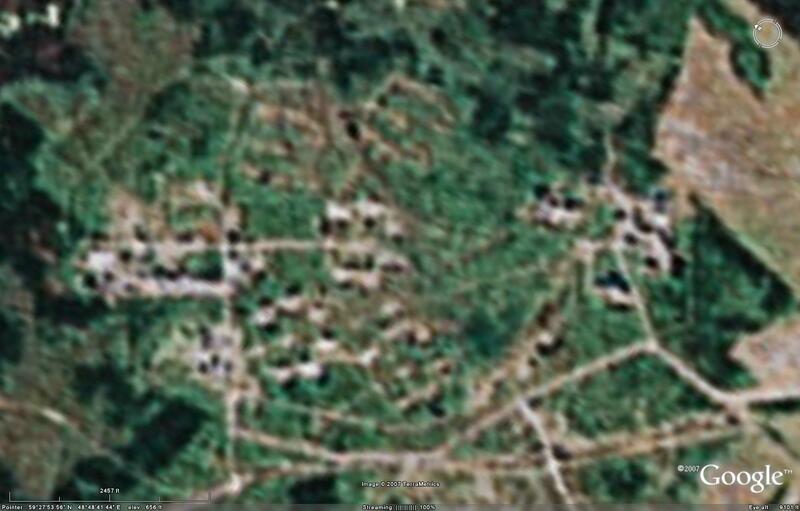 This site is a rarity insofar as it has remained mostly intact, allowing the site layout to be studied using present-day imagery. 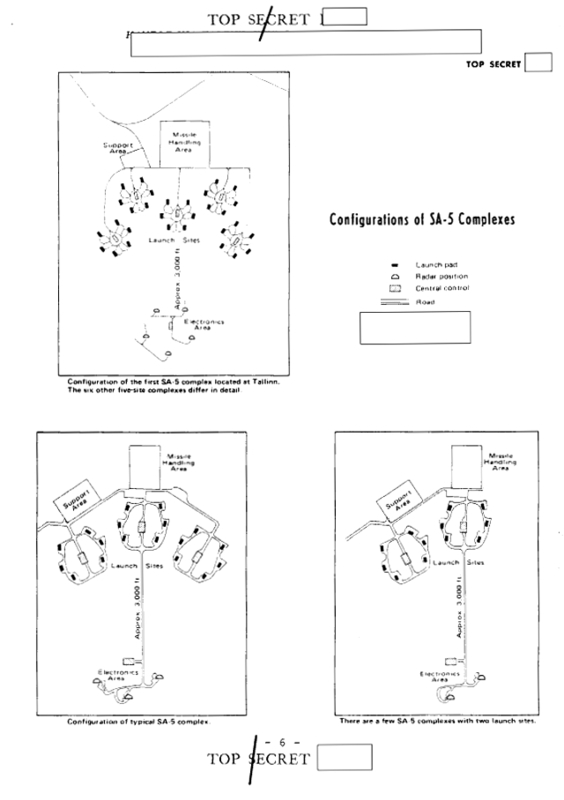 The S-25 sites all followed the same standard layout seen above. The radar position, seen below, was located approximately 1.5 kilometers behind the launch area. Two B-200 radars were positioned in the forward area of the bunker, which housed the command and control section and the crews who controlled the site. The launch area, seen below, contained the individual launch positions. Each launch area contained three V-300 fixed launch assemblies. 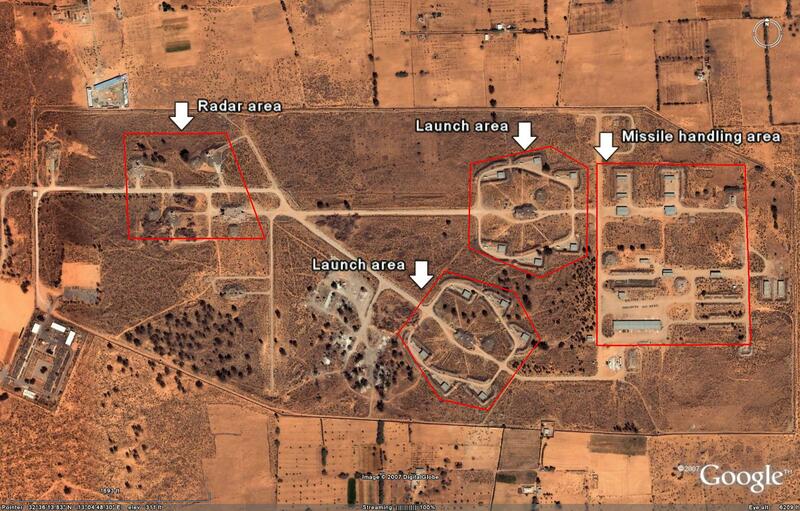 Each S-25 site contained a number of launch areas. 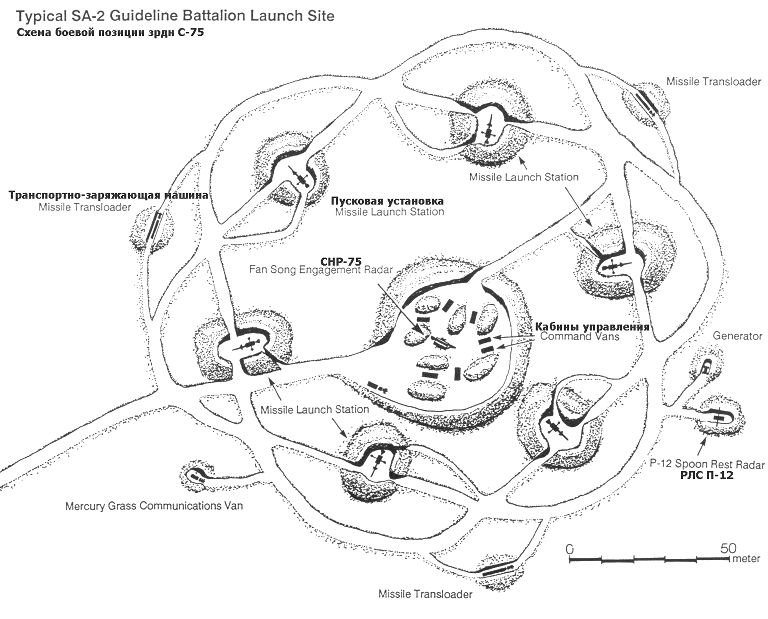 The interlocking nature of the launch areas gave the S-25 sites their distinctive rectangular herringbone appearance. All of the site areas were connected using concrete roads. 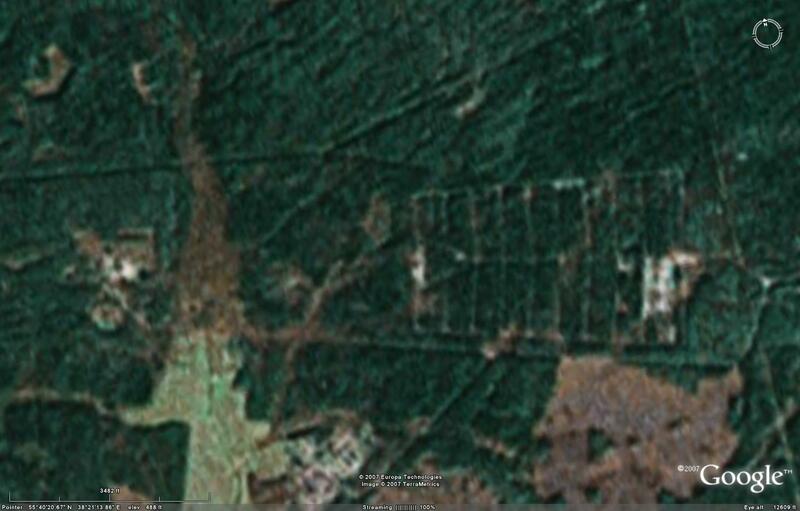 As these roads still exist, carving their tell-tale herringbone path through the forested areas outside Moscow, former S-25 sites are relatively easy to locate and identify. As the S-25 has since been replaced by different variants of the S-300P family, there are no active sites located in Russia. The sites themselves do still exist for the most part, and many have been reused for other purposes. 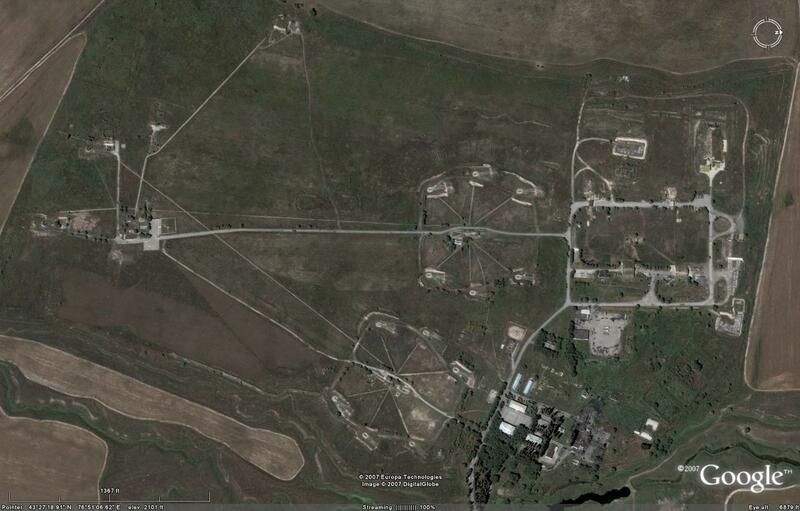 Alternatively, many S-25 sites have been reused by the Russian defense establishment. 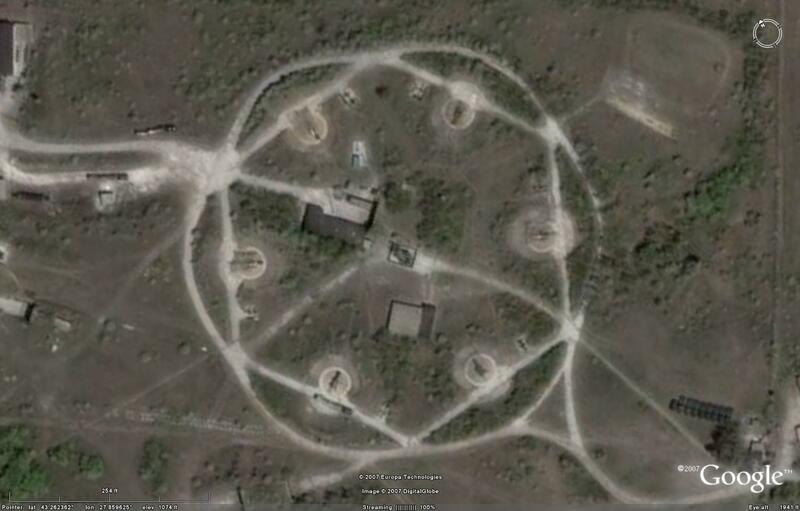 Quite a few sites, including the site shown above, feature active S-300P SAM batteries. Other sites have formed the basis of the sites for the exoatmospheric component of Moscow's ABM network over the years. For more information and descriptions of these facilities, reference the relevant article found at this site. The S-75 / SA-2 Guideline was the first SAM to be used in anger, en masse, and changed the character of air warfare forever. 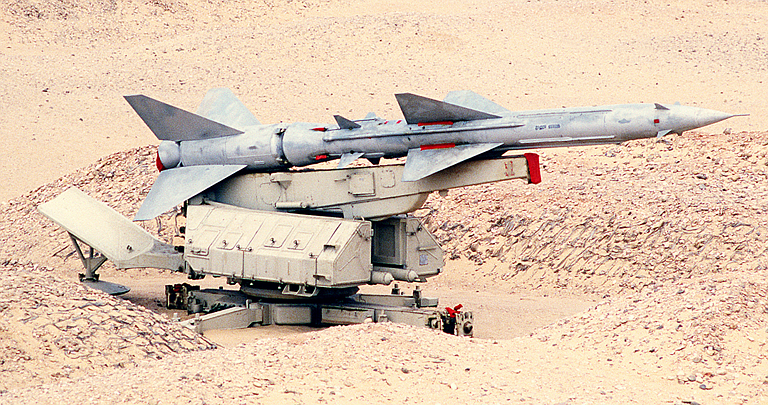 Depicted Soviet supplied S-75 / SA-2 Guideline and SM-90 launcher operated by Egypt in 1985 (US DoD). The S-75 (SA-2 GUIDELINE) SAM system was developed by the USSR to provide a semi-mobile, widely deployable SAM system to complement the S-25 system in place around Moscow. Deploying the S-25 across the vast geography of the USSR would have proved to be prohibitive in cost, so a smaller, more compact, and therefore cheaper SAM system was needed for air defense across the USSR and the Warsaw Pact member states. The S-75 remains in widespread use to this day, a testament to the robust design and capability of this Cold-War era SAM system. Chinese-produced derivatives share the same deployment layouts, a testament to their S-75 heritage, and are designated HQ-2. While the S-75/SA-2 was a new design it clearly showed its heritage. Two key design requirements for the S-75 were better range performance compared to the S-25, and much better deployability, as concreted pads were time consuming and expensive to construct. The S-75 missile round retained the cruciform wing and nose canard design of the S-25 round, as well as the command link guidance scheme. While the cruise engine employed a similar hypergolic propellant mix to the S-25, it used a mono-propellant driven turbopump to feed the new Isayev S2.711 engine. Unlike the S-25, the S-75 missile used a new Kartukov designed solid propellant first stage to accelerate the missile off its launcher. The new S-75 was designed for much higher mobility, using a towed SM-90 trainable single rail launcher for the missile, which was carried in the field by a semi-trailer PR-11 transloader, towed by a Zil 6 x 6 tractor. Once the SM-90 launcher was put in position, and leveled, the missile round was transferred to its launch rail and locked into position. The SM-90 would then be elevated and steered to point the missile in the direction of the target. A single S-75 battery was made up of six SM-90 launchers clustered around a single RSNA/SNR-75 Fan Song engagement radar. The Fan Song could control up to two missile rounds concurrently against a single target. Cables were used to connect the launchers to the Fan Song radar. The Fan Song was a new design, but also showed its heritage, with the basic arrangement very similar to the earlier Yo-Yo. Unlike the Yo-Yo, with two massive and separate antennas for elevation and azimuth tracking, the Fan Song used a pair of fixed trough antennas mounted on a single towed trailer, with a third dish antenna for the missile command uplink. A Fan Song would produce two fan shaped “flapping” beams, one for azimuth tracking, the other for elevation tracking, both of the target and a beacon in the tail of the missile. Targets were typically acquired by the VHF band P-12 Spoon Rest acquisition radar, which used a characteristic horizontal boom mounting two stack arrays of Yagi antennas, better known for their use as rooftop TV aerials. Once acquired by the Spoon Rest, the target position was relayed to the Fan Song which would slew the whole antenna package in the direction of the target and initiate angle and range tracking for a missile shot. A pair of missiles would be fired and an analogue computer used to generate steering commands to fly the missile to a collision with its target, using a radio uplink. A radio proximity fuse was used for the high explosive warhead. The first S-75 batteries were deployed in the Soviet Union in late 1957. The missile’s first known kill against a Western aircraft remains disputed. Some sources claim it was a U-2 over China in 1959, some Gary Powers’ CIA operated U-2 lost over Sverdlovsk in May, 1960. Many sources also claim a Soviet MiG-19 Farmer was also downed by PVO missileers in the same engagement. An S-75 was used to shoot down a US Air Force U-2 flown by Maj Rudolf Anderson over Cuba in October, 1962. Major Anderson was killed in the engagement. The lethality of the S-75 against the subsonic U-2 rapidly led to the development of the Mach 3 A-11/SR-71 Blackbird. By 1965 the S-75 was widely deployed in the Soviet sphere of influence, and the system scored its first kills against combat aircraft. Russian sources claim that 4600 launchers were deployed in the Soviet Union alone by 1970. The command-guided V-750 missiles have a 195 kg HE fragmentation warhead. Ranges vary across variants, with a maximum of between 30 and 67 kilometers. Minimum ranges are as little as 6 kilometers. Altitudes range from a minimum of as little as 100 meters to a maximum of 30,000 meters, depending on the variant. Target engagement functions are handled by the RSN-75 radar set, a C- or X-band band system with a range of up to 145 kilometers, depending on the specific model, and a capability to engage a single target at a time. In an interesting footnote, the initial designator for the RSN-75 radar in the West was FRUIT SET, as evidenced by declassified CIA documentation from 1961 (NIE 11-5-6, available online at the CIA's FOIA website). No reason has yet been discerned for the change to FAN SONG. 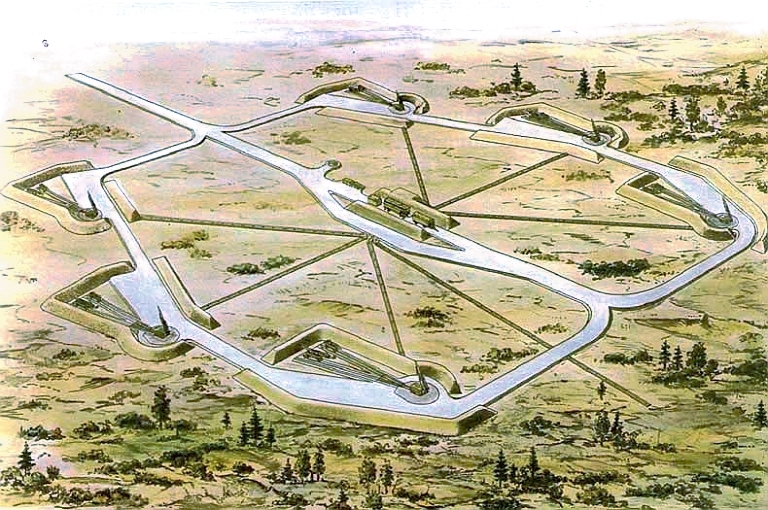 CIA rendering of fixed revetted SA-2 site circa 1966. 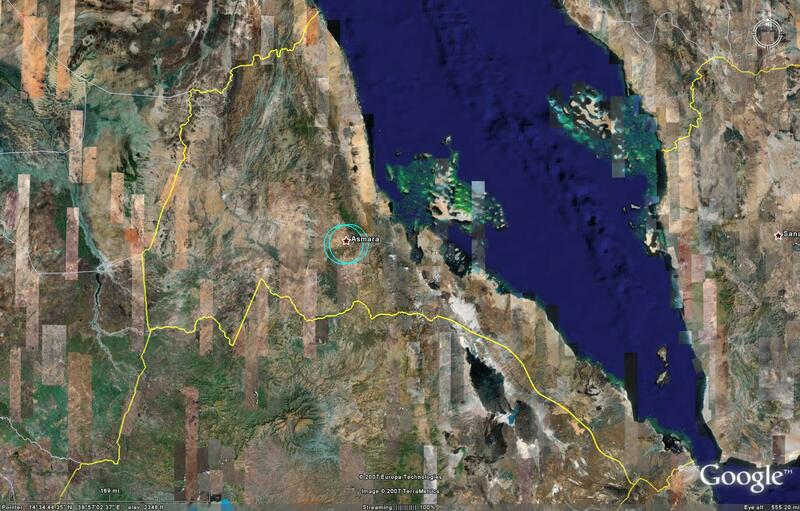 S-75 SAM sites are relatively easy to identify on high-resolution imagery. S-75 components are typically arranged in a circular pattern. 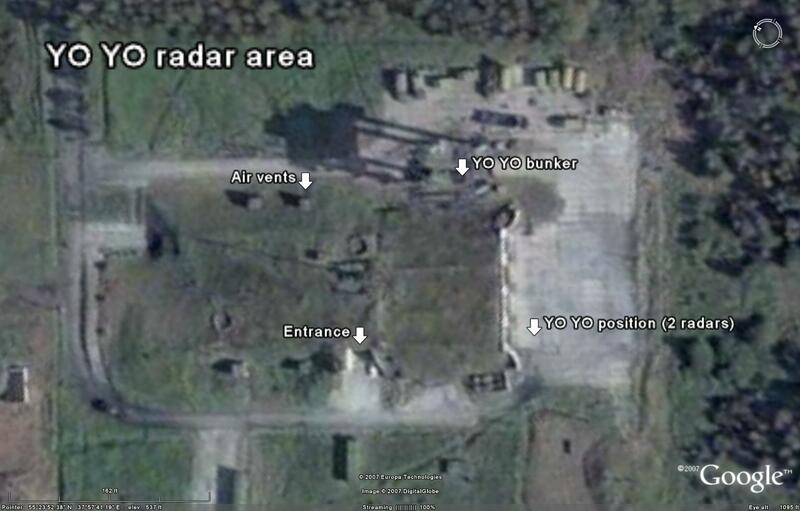 The RSN-75 engagement radar is positioned in the center of the site, and there are six single round SM-90 rail launchers for the V-750 missiles positioned in a circular pattern facing outward around the radar position. A common practice with permanent sites was to locate the UV and AV operator and electronics vans in a trench or a bunker, next to or below the Fan Song radar head van. Electrical generator vans were also located in trenches, revetments or bunkers. 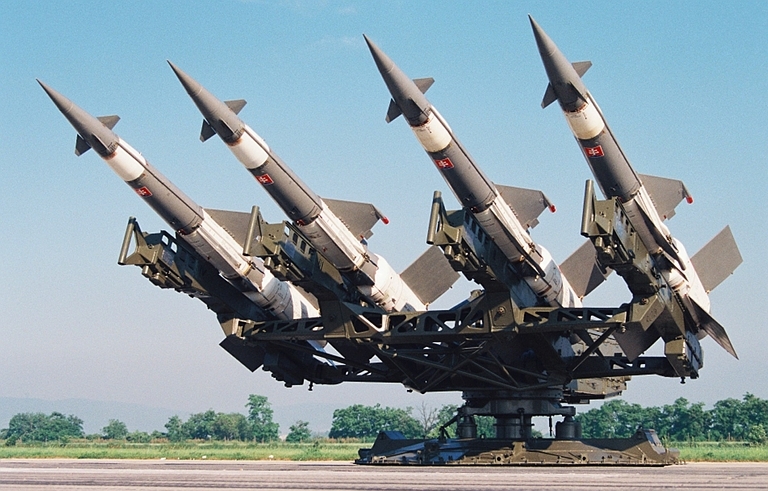 The V-750 missiles are between 10.6 and 11.2 meters in length, depending on the variant. The launchers measure between 10 and 10.5 meters in length in overhead imagery, depending on the resolution. S-75 sites tend to have a diameter of approximately 0.2 kilometers, although diameters of 0.16 and 0.23 kilometers have also been noted. Deployment in crowded urban areas or in some terrain can necessitate a closer or wider spacing of the site components. The V-750 launchers are emplaced in circular revetments between 20 and 25 meters across, with Chinese HQ-2 sites having revetments up to 30 meters across. 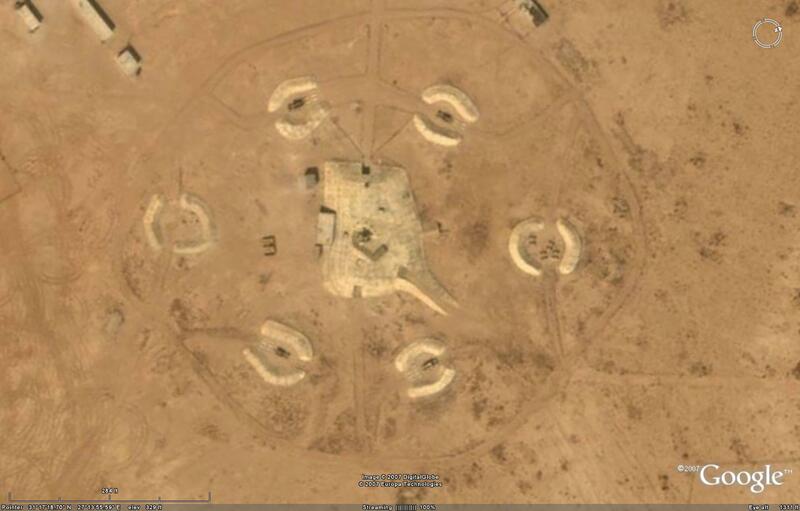 The following image depicts a typical S-75 site in Yemen. Major components are labeled, including a TET used to transport missile reloads from the storage area to the launch rails. The common practice of placing the rail launchers in sturdy revetments enables inactive S-75 sites to still be identifiable, even though they may have been unused for quite some time. 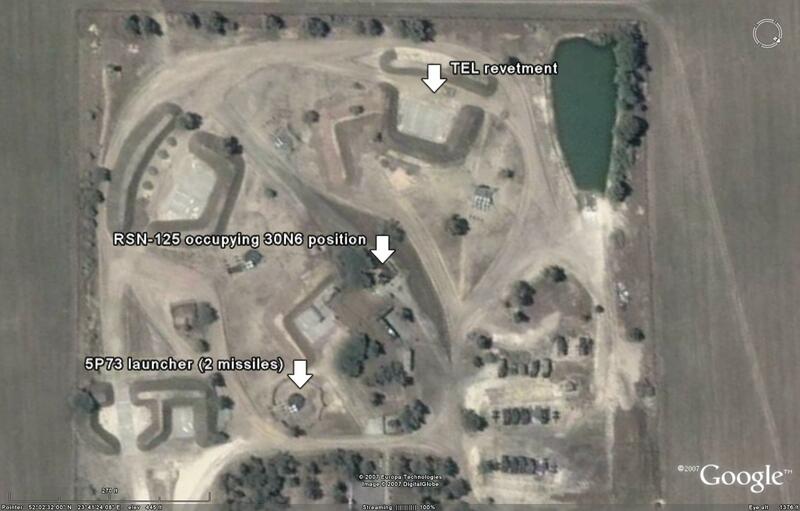 The following images depict the most common S-75/HQ-2 site layouts. 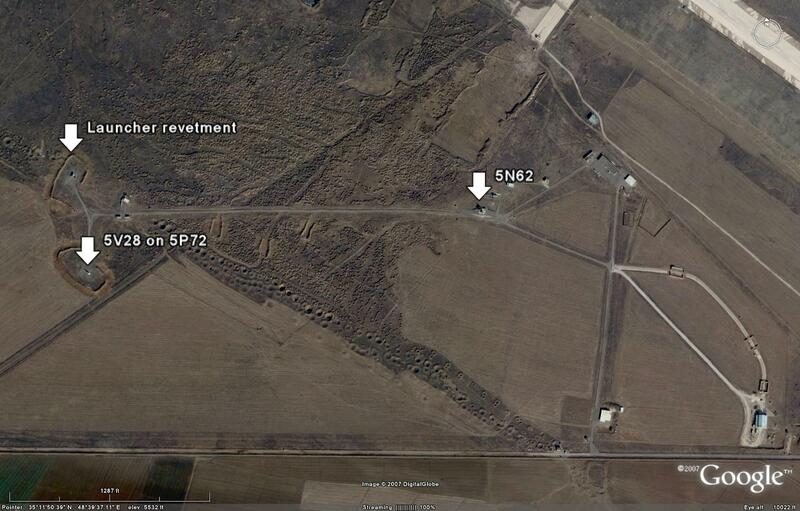 Not all S-75 or HQ-2 sites feature a radar bunker or even revetments. In this case the site must be identified by the number of launchers, the size of the missiles, and any identifiable support equipment. The site depicted below is such an example, found in Libya. Note that sand berms have been constructed around some of the components, but these are a far cry from the sturdy revetments found at prepared site locations. S-75 and HQ-2 users have developed some unorthodox site layouts for a variety of reasons. Regardless of the layout, two elements will always be present at an S-75 or HQ-2 launch site: the Fan Song or Gin Sling engagement radar, and the missile rail launchers themselves. The most common unorthodox site layouts will be discussed here. 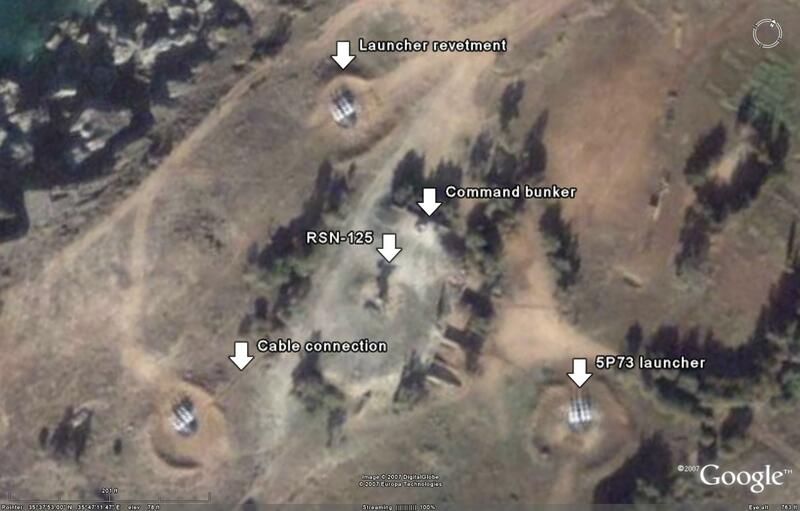 Vietnam has created an unorthodox site layout for its S-75 batteries. The revised layout consists of a single RSN-75 engagement radar surrounded by four, rather than six, rail launchers, arranged in various patterns. The reasoning behind the revised layout is unclear, but there are a few logical reasons which may be behind the unusual deployment. First, Vietnam may simply be taking launchers and missiles out of service to save maintenance and upkeep costs. Given that the RSN-75 can only prosecute one engagement at a time, reducing the number of launchers at a given site may be strategically acceptable. Secondly, Vietnam may be limiting the number of in-service missiles to reduce the wear and tear on important defensive assets, enabling more missiles to be kept in reserve storage for wartime use. 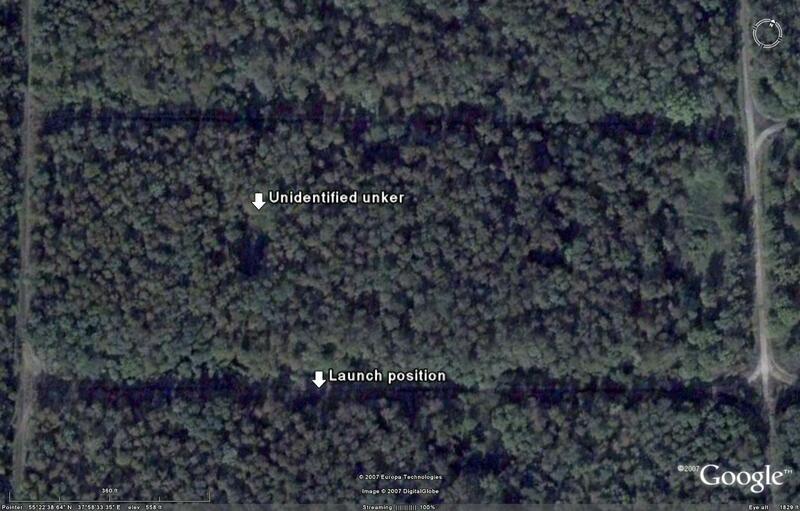 Thirdly, as the revised sites do not maintain the 360-degree layout with respect to the launchers, reducing the number of launchers at certain sites may be indicative of Vietnam's strategic thinking insofar as potential threat ingress routes are concerned. 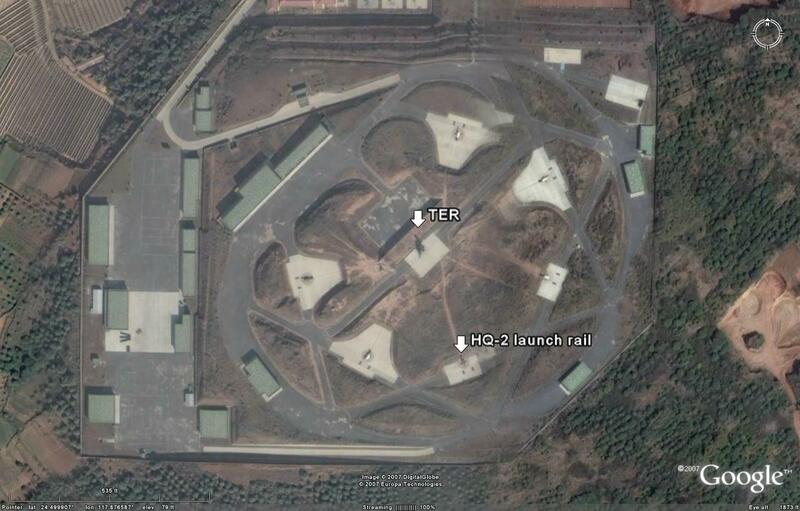 All of Vietnam's S-75 sites feature this layout save one, but even that site is only configured with four launch rails. 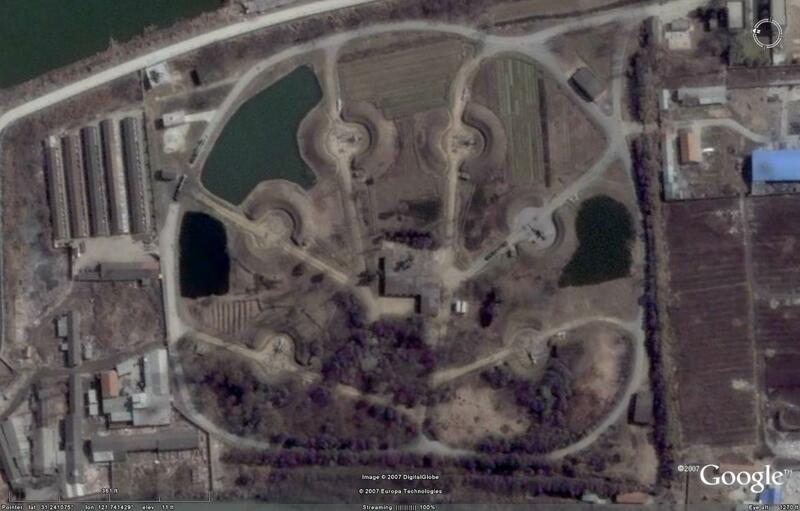 The Chinese military has been forced to employ an unorthodox HQ-2 site layout due to force modernization issues. 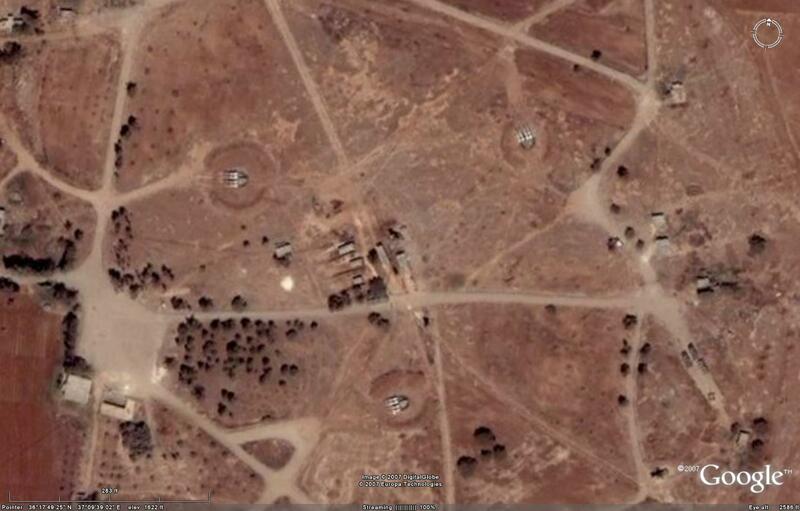 A number of HQ-2 sites are apparently being converted to S-300P or HQ-9 sites. In order to mitigate the potential loss of capability while a site is being modernized, the HQ-2 battery is simply relocated off-site to a nearby area. 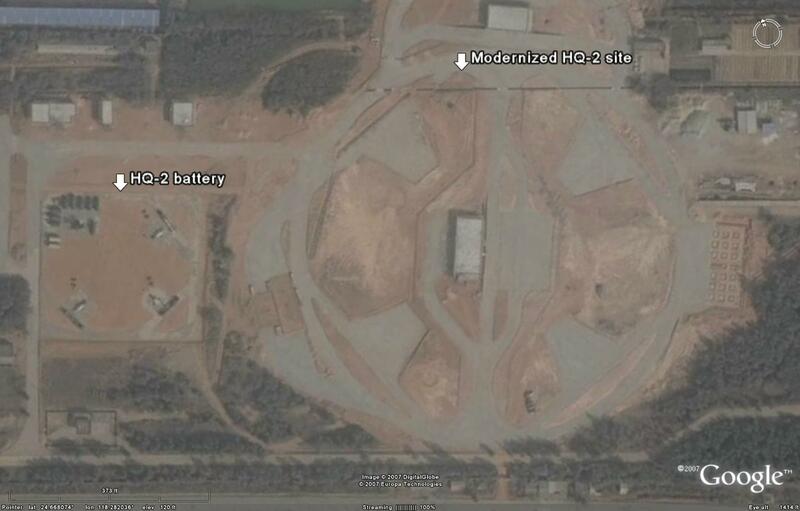 The following image depicts a Chinese HQ-2 site being modernized to field the S-300P or HQ-9 strategic SAM system. Note the HQ-2 battery which has been repositioned to the northwest of the site being refurbished. In this case, the battery is kept at half-strength. 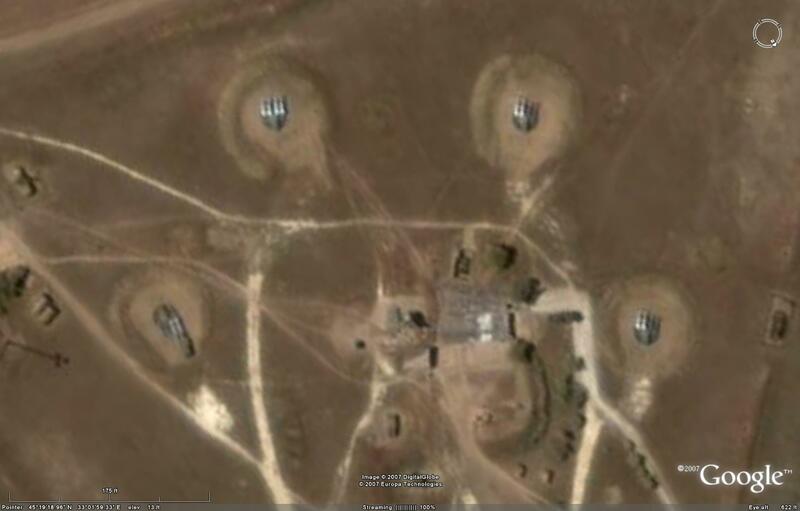 Once site modernization is complete, some Chinese S-300P or HQ-9 sites appear to retain the HQ-2 battery, which has been relocated back onto the "new" site. This ensures that local air defenses will not be degraded while S-300P or HQ-9 components are procured or produced in sufficient numbers to take up residence at the relevant site or sites. While the S-75 does not possess the greater range of much newer strategic SAM systems such as the S-200 or the S-300P series, it is still capable of fulfilling a prominent role in the air defense network of a given nation. Deployed SA-3 5P73 four rail launcher (images © 2009, Miroslav Gyűrösi). The S-125 (SA-3 GOA) SAM system was developed to provide additional low-altitude coverage in areas already defended by S-25 and S-75 SAM systems. 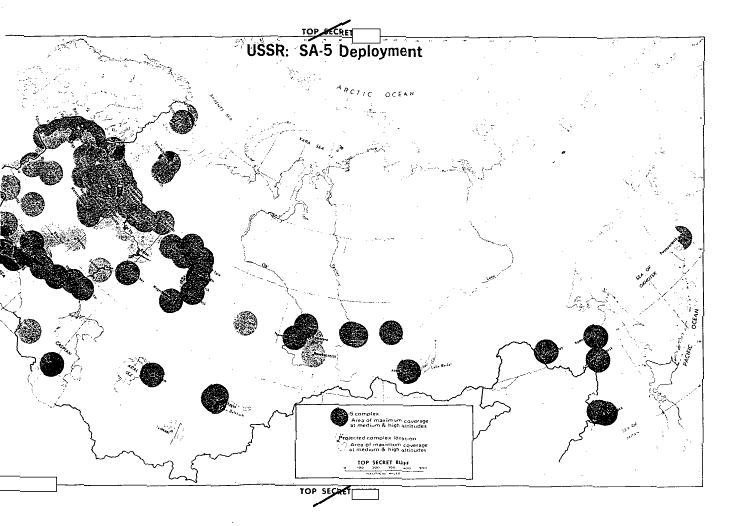 S-125 SAM systems were also deployed in areas identified by the Soviet Military as potential enemy low-altitude ingress routes en-route to high-priority targets. Interestingly, the S-125 began life as the M-1 (SA-N-1 GOA) naval SAM system, and was chosen for land-based use early in development. Many S-125 SAM systems remain in operation to this day, and there are numerous modifications available. The most current modification is the Pechora-2M mobile variant. The S-125 SAM system is a two-stage strategic SAM system. Two missiles are employed, the 5V24 and the 5V27. Both weapons are command guided. The 5V24 missiles possess a 60 kilogram HE fragmentation warhead, and have a range envelope of between 4 and 15 kilometers, with a reach of between 100 and 10,000 meters in altitude. The 5V27 missiles possess an 70 kilogram HE fragmentation warhead, and have ranges between 4 and 25 kilometers with a reach of between 20 and 18,000 meters, depending on the specific variant. The 5V27 can be identified by the addition of two braking fins on the booster coupling section. Upgraded missiles used in Pechora-2 and Pechora-2M systems have a maximum range of 38 kilometers. The X-band RSN-125 (LOW BLOW) radar handles target engagement functions, with a range of 110 kilometers. The RSN-125 has the capability to track 6 targets simultaneously, with the ability to engage a single target at a time. CIA NIE 11-3-62 rendering of fixed revetted S-125 / SA-3 Goa site. Site design followed a similar practice to that followed in the construction of S-75 / SA-2 Guideline sites. Finally, some S-125 users deploy their systems in seemingly random manner dictated by either terrain constraints or potential threat ingress routes. There are numerous other variations of the S-125 site; the important factor in identifying the site is to identify the system components. Fortunately, the distinctive rail launchers themselves, either loaded or unloaded, are readily identifiable in high-resolution imagery. Other nations, such as Eritrea, Peru, and Zambia, employ the S-125 as their primary air defense system, positioning their launchers around key areas. In these cases it is likely that interceptor aircraft would serve as the primary means of air defense, as the SAM network is lacks the density to provide unbroken area coverage. 5N62 Square Pair FMCW engagement radar on display at Kecel in Hungary. Note the Square Pair at maximum elevation angle in the background (Image © Miroslav Gyűrösi). The S-200 (SA-5 GAMMON) SAM system is a long-range air defense system designed to defend large areas against the full spectrum of airborne targets, including high-speed and high-altitude aircraft. The S-200 was originally conceived in part to defend against the expected overflights by Lockheed SR-71 Blackbird reconnaissance aircraft, although no such overflights ever took place due to a political restriction of manned overflights of the USSR in the wake of the Francis Gary Powers shootdown. The S-200 entered operational service in 1967 and has remained on combat duty in various nations worldwide ever since. In a little known role, the S-200 was also employed as a national-level ABM system for a time. This is discussed elsewhere. The S-200 SAM system is a long-range strategic SAM system. The FMCW SARH-guided two-stage 5V21 and 5V28 missiles have a 220 kg HE fragmentation warhead. The 5V21 and 5V28 differ from previous Fakel-designed air defense missiles insofar as their first stage is not a jettisonable booster stage, but rather four strap-on rocket motors. The missiles themselves are very large, with lengths of 10.5 meters for the 5V21 and 10.8 meters for the 5V28. Ranges vary from variant to variant, with a maximum of between 150 and 300 kilometers. Minimum ranges are between 7 and 17 kilometers, depending on the variant. Minimum altitude for all variants is 300 meters, with a maximum altitude of between 20,000 and 40,000 meters, depending on the variant. Target engagement functions are handled by the 5N62 (SQUARE PAIR) radar set, a C-band FMCW system with a range of 270 kilometers, and a capability to engage a single target at a time. S-200 battery deployment illustration from Soviet technical manual. 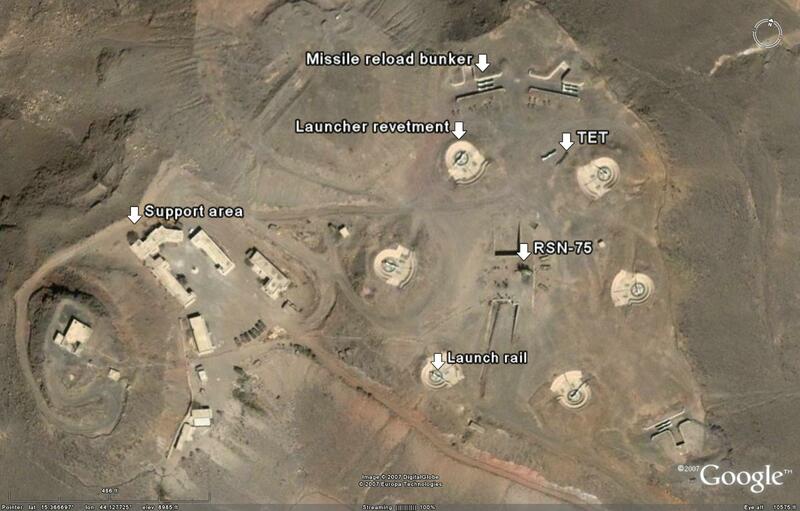 Note each launcher has a pair of 5Yu24 rail transloaders with ready 5V28 rounds (Almaz). A typical S-200 site will contain between two and five launch areas, each containing launch pads for six 5P72 launch rails. 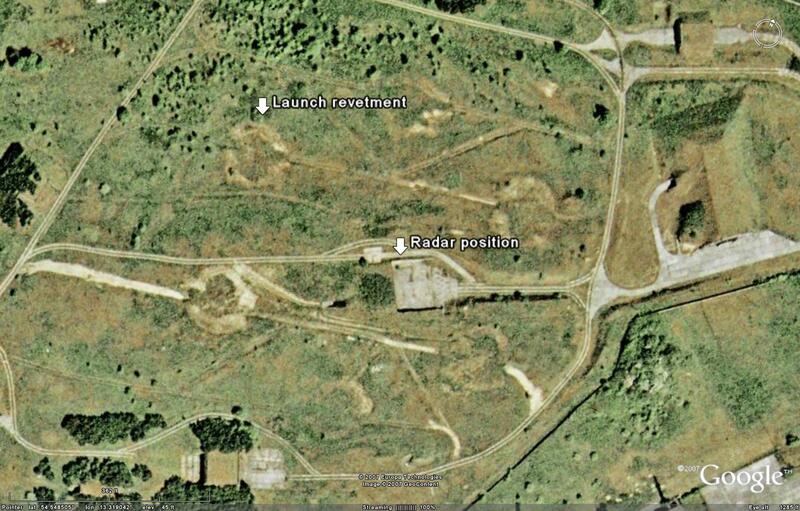 The radar area will contain a single 5N62V/K-1V radar head van for each launch area present in the site. This permits each site to engage multiple targets, reducing the negative impact of the 5N62's single target engagement capability. 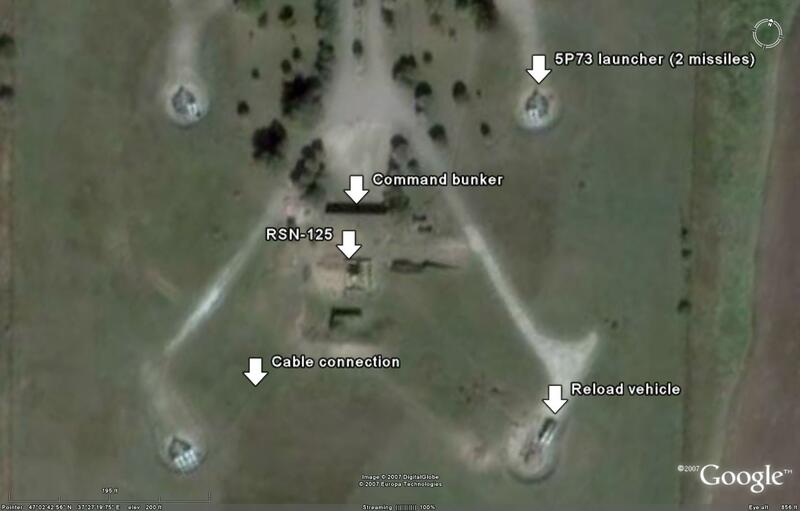 The missile Launch Control Centre van, the K-3, and the Square Pair K-2 operator van, are sited in close proximity to the 5N62V/K-1V, often behind berms, in a revetment, or a bunker. 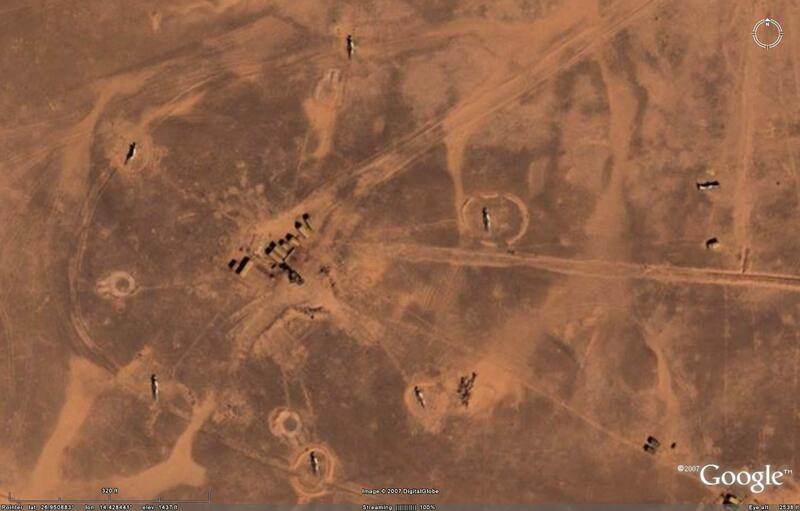 The image below depicts a typical active S-200 site located in Libya. Relevant areas are annotated. 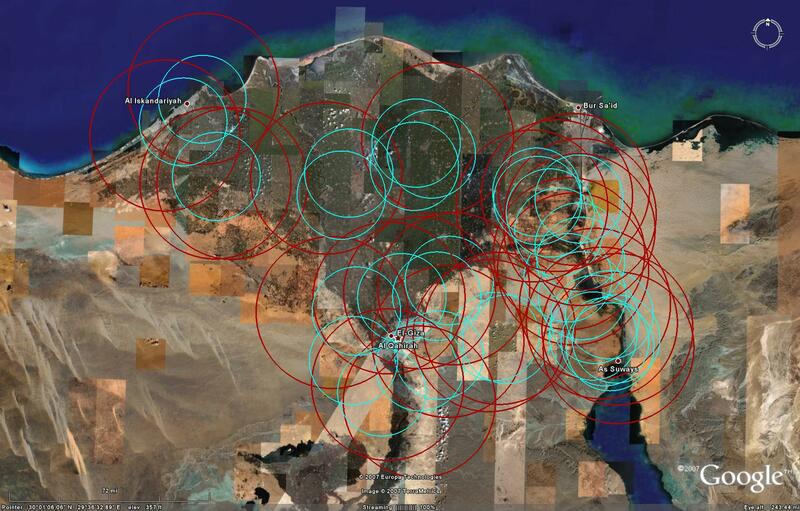 The following image depicts the Libyan site's radar area. 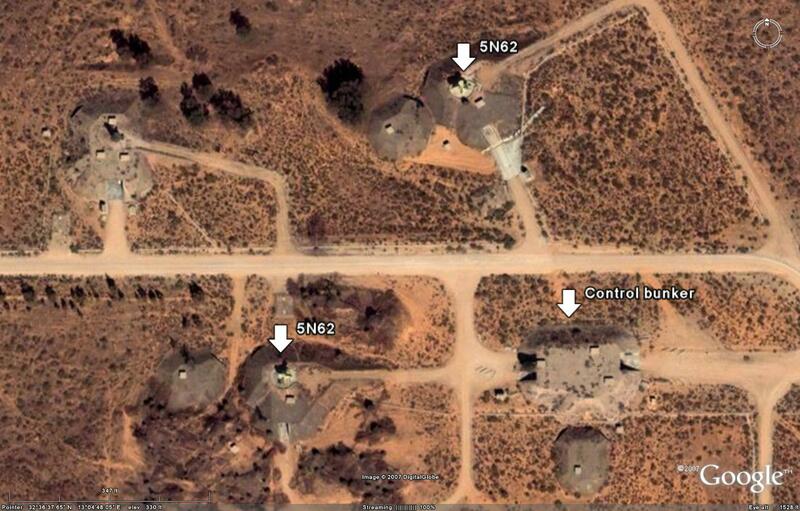 Note the placement of the two 5N62 radars, and the location of the control bunker housing the site's K-2 and K-3 vans. 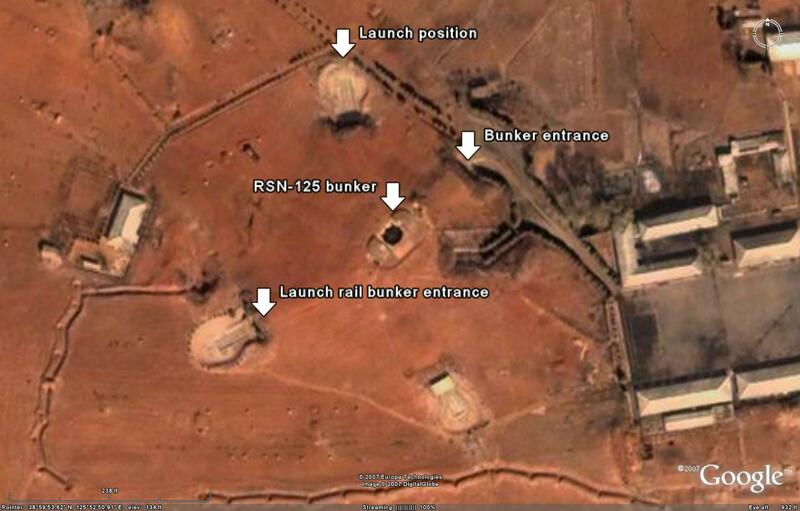 The launch area is detailed below. Launch areas vary in arrangement from nation to nation, but for the most part display a spade shape as seen here. It is common for S-200 sites to feature revetments for the 5P72 rail launchers, and individual environmental shelters to store the preloaded 5Yu24 rail transloaders during periods of maintenance or inactivity. 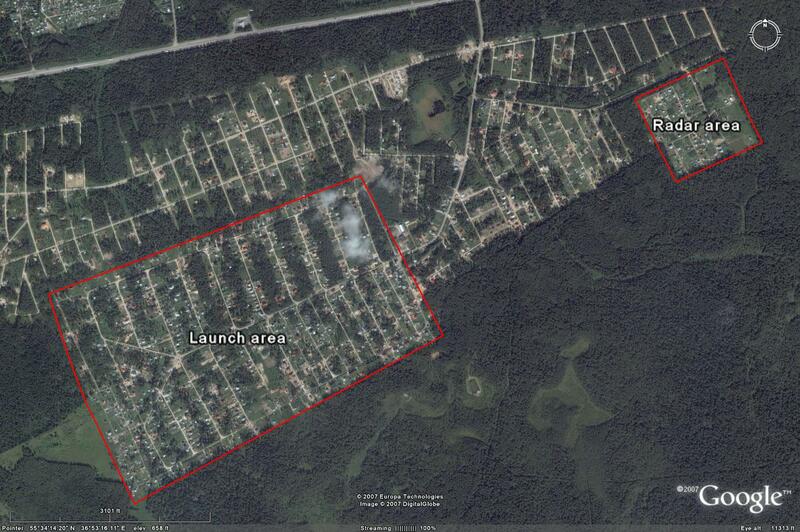 Each launch area is controlled by crews in a centrally located bunker, protecting the K-2 and K-3 vans. Note the cable connections visible between the control bunker and the launch rails. 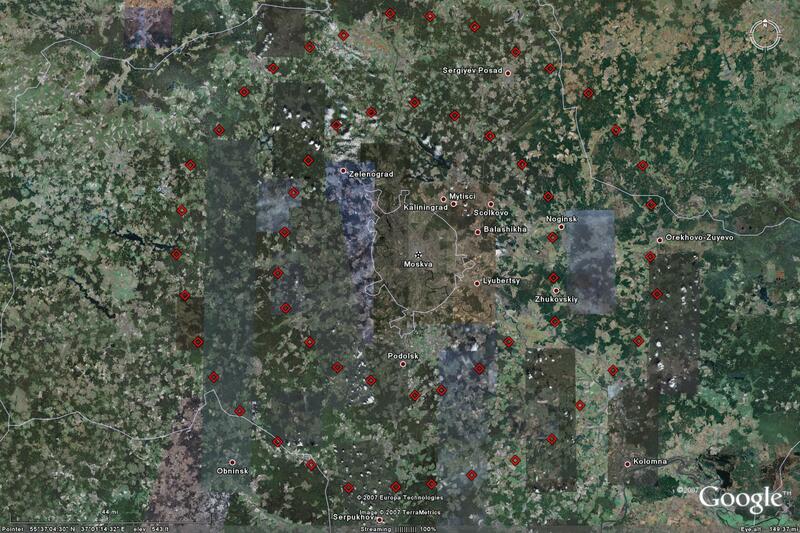 As witnessed in the imagery provided above, S-200 sites are rather large and expansive. Due to the large footprint of an S-200 site and the plethora of associated structures, inactive S-200 sites are relatively easy to identify. The following images depict the most common S-200 site layouts. 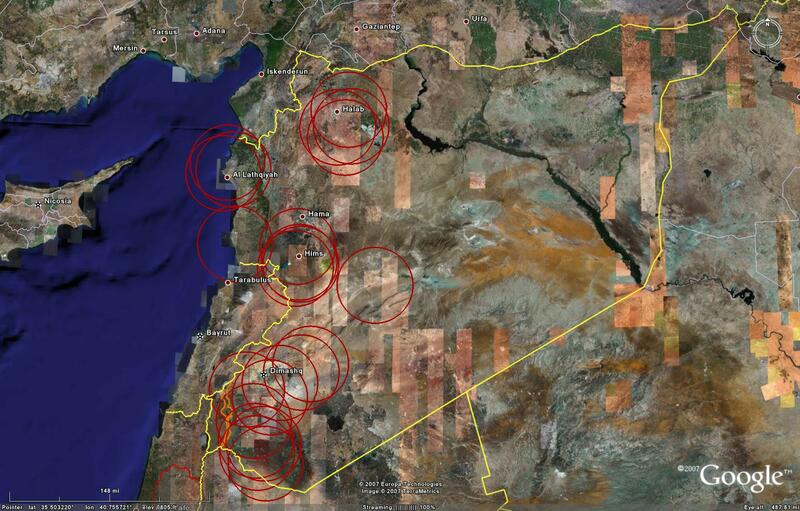 Most S-200 sites feature either two or three launch areas. 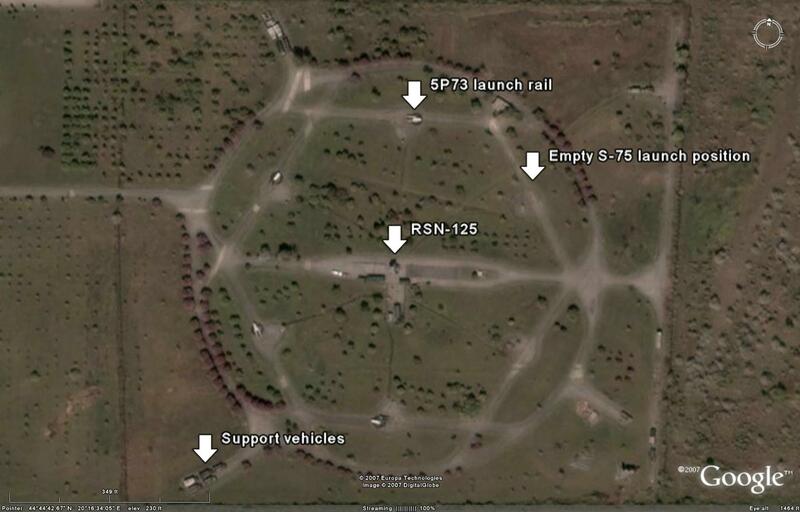 The following image depicts an active S-200 site in Kazakhstan displaying the two launch site configuration. While there are only two missiles visible on launch rails in the eastern launch position, there are two 5N62 radars visible, implying that the entire site is still active. 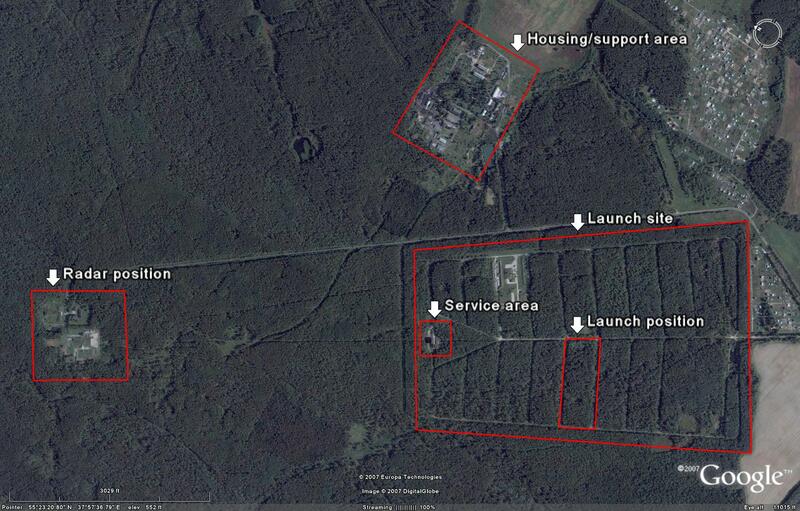 The following image depicts an active S-200 site in the Ukraine displaying the three launch site configuration. Only the southernmost launch area appears to be active, as the launch rails appear to have been removed from the other two sites. 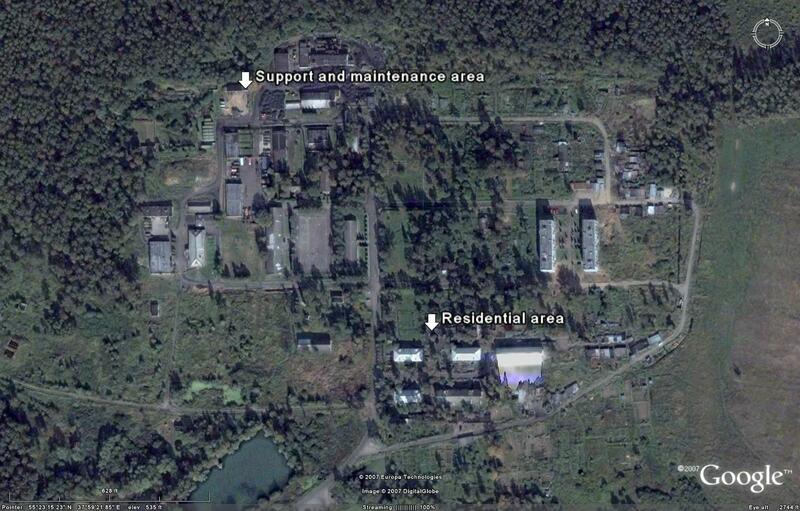 Due to the expansive nature of an S-200 complex, S-200 sites can be identified in low-resolution imagery. While this does not provide any indication as to the site's operational status, it does provide the analyst with a location to file away for future observation should coverages be updated. 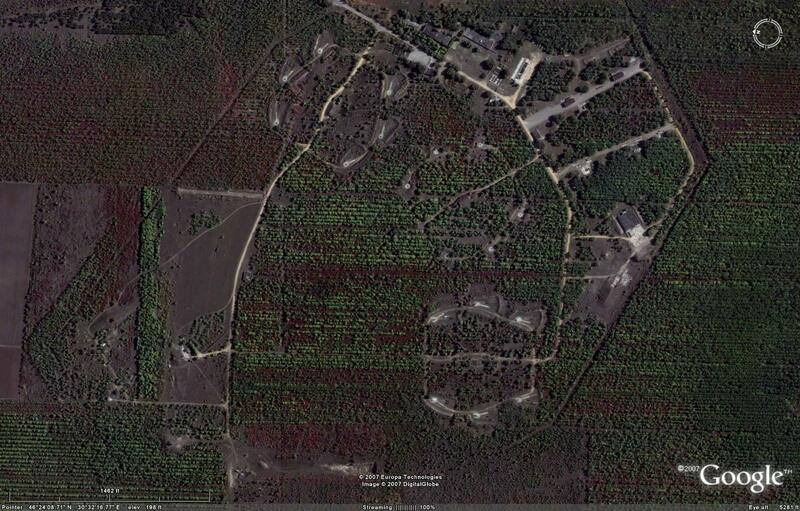 The following image depicts a Russian S-200 site captured in low-resolution imagery. 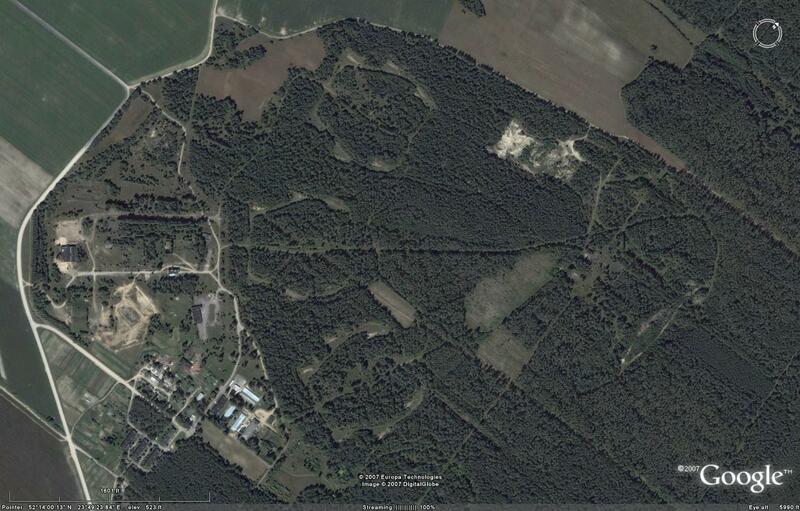 This is one of two identified S-200 sites containing five launch areas. 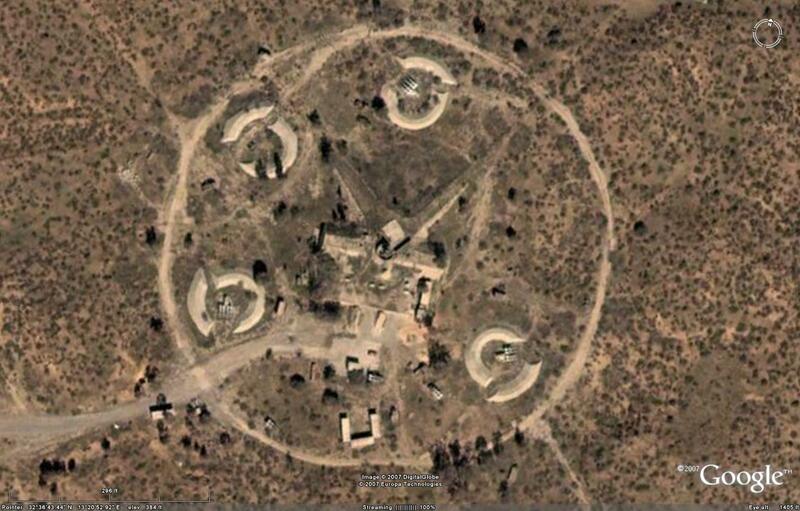 SA-5 Gammon Missile Site Design [Technical Report APA-TR-2009-0603-A]. North Korea and Iran have adopted unusual deployment strategies for their S-200 batteries for various reasons. North Korean S-200 batteries are deployed in a fashion designed to increase their survivability. 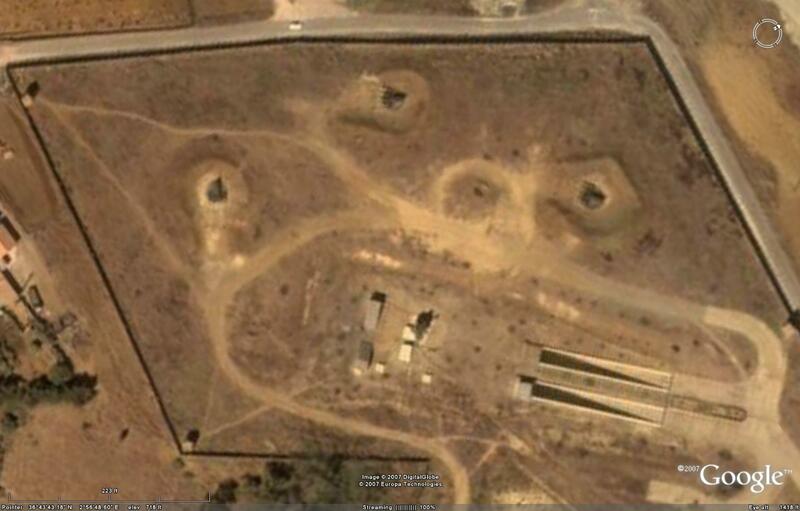 As seen previously in examining a North Korean S-125 site, the DPRK chooses to use a series of bunkers to protect the system components. There are individual hardened shelters visible for each 5P72 rail launcher, as well as subsurface housings to protect the 5N62 radars when not in use. 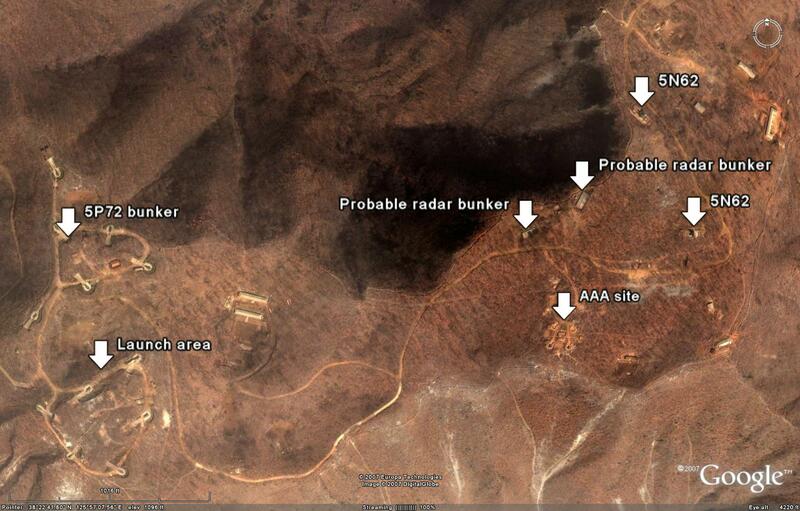 Two other subsurface bunkers are also visible, implying that the site may contain a total of four 5N62 radars. 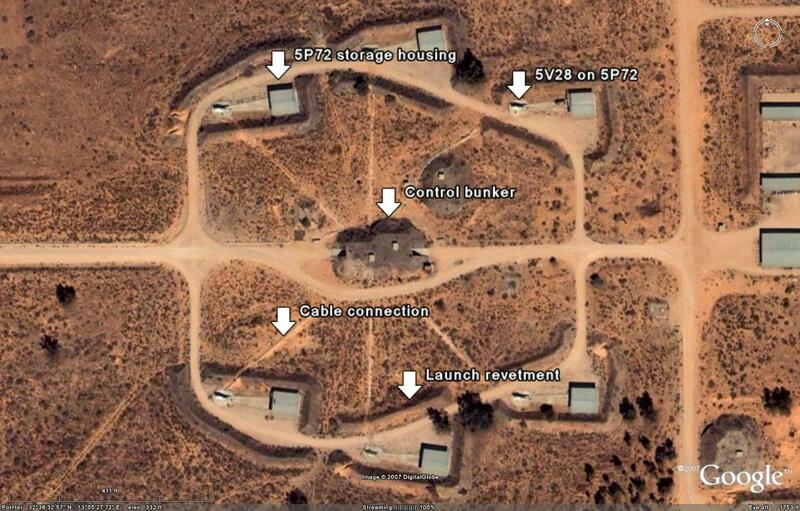 Iranian S-200 batteries, in comparison to other users, are very unusual in their deployment. 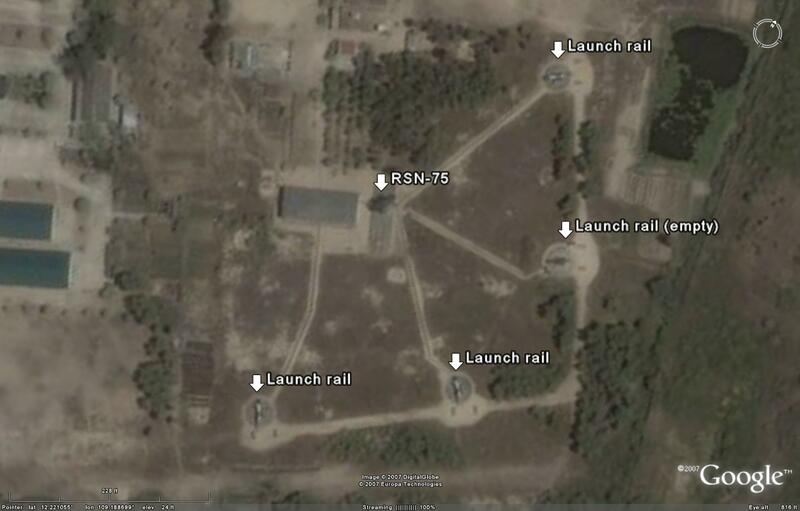 Iran deploys a single 5N62 radar with two 5P72 rail launchers at each location. This is highly irregular, perhaps implying that Iran did not purchase a full complement of missiles or launch rails. 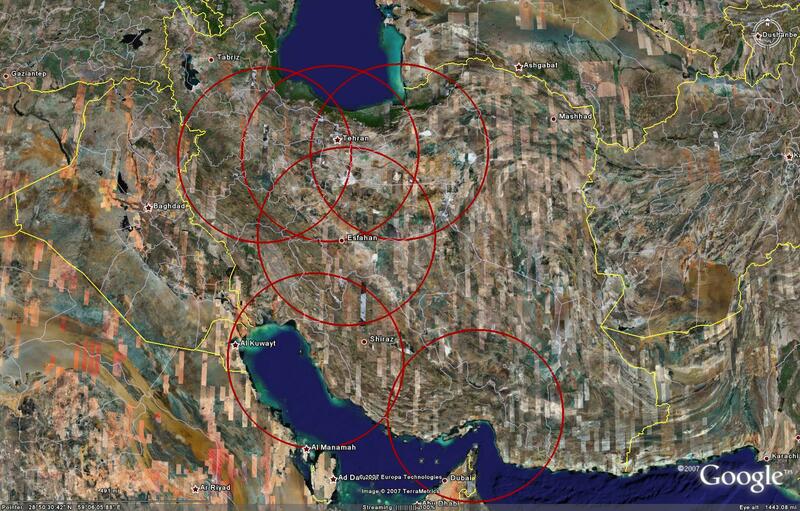 It is also possible that, given the capability of the S-200 system, Iran views them as probable targets in any sort of military conflict and as such does not see the need to deploy a significant number of components at each site, choosing instead to hold them in reserve. As the 5N62 can only engage a single target at a time anyway, this would seem to be a sensible strategy. The S-200 SAM system possesses very long range, which will only be surpassed once the 400 kilometre range S-400 Triumf / SA-21 enters full operational service. To that end, the S-200 is capable of providing air defense over large geographical areas. It should be noted that the long-range S-200 is commonly featured as part of an integrated network which incorporates shorter-range systems such as the S-75, which also helps to cover close-in targets which close within the rather long minimum range of the S-200 system. As the S-200 is not intended to counter close-in targets, this should not be considered a design flaw of the system.